Click to See our Christmas Decorations! Magor Annual Event Live Music! CAR SHOW & CONCERT Live Music! WARNING: THIS ROW IS TEMPORARILY COLLAPSED. to our beautifully preserved antebellum home in Jefferson County’s Madison Indiana historic district overlooking the Ohio River. The Madison Historic District, also known as Downtown Madison, on the National Register of Historic Places as a National Historic Landmark, is one of the loveliest and best preserved cities in the nation. As one of the premiere historic sites in the United States, Madison Historic District is naturally one of the top romantic tourist attractions for couples of all ages, honeymoon destinations, romantic retreats, anniversary destinations and wedding locations. Established in the 1800’s, Madison has the charm of the old South and an interesting history. 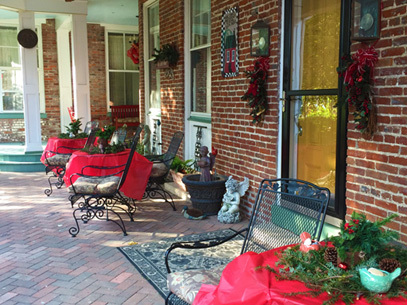 As you learn more on this web site and others, it’s easy to see why the Azalea Manor is considered one of the best Indiana Bed and Breakfast Inns. Azalea Manor located in the heart of the historic district is within walking distance of an outdoor shopping mall on Main Street made of individually owned and operated specialty & variety shops, antique stores, coffee shops, handcrafted candy shops, restaurants, the Ohio River, the visitor’s center, public library, museums, public historic homes and churches. 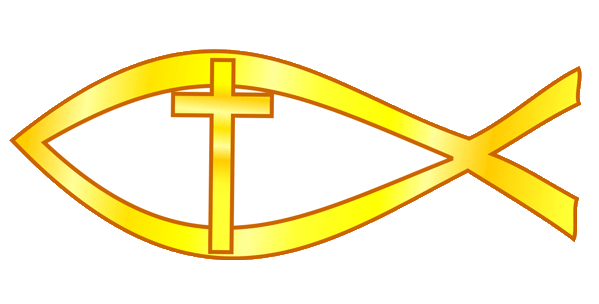 Well known Hanover College and Clifty Falls State Park are just a few miles west of the Bed & Breakfast, and Cedar Cliffs Park is a few miles to the east. Azalea Manor, like the surrounding Madison Historic District, is for those who like to travel inn style. 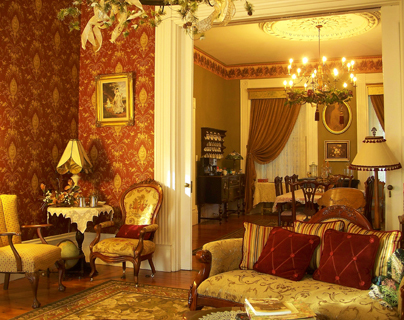 The Azalea Manor B&B, one of the oldest homes in Madison circa 1833, emanates the ambiance and charm of a lost era with ten foot double entrance doors, twelve foot ceilings, velvet fringed drapes, old shutters and window cornices, antique furnishings, and large Italian marble fireplaces. A large library of classic books from the past, classic records (old 78, 33, and 45’s) ranging from the 1920’s through the 1960’s, and glowing hurricane lamps will soon take you back in time. Think of us when you plan to visit Madison. The Manor with four guest rooms has modern comfortable beds and private baths; but, is otherwise decorated with antiques. The accommodation includes an abundant breakfast each morning served in the formal dining room or on the veranda in appropriate weather. Please advise if allergies need to be addressed. 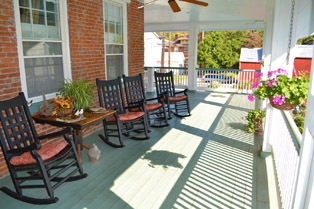 Several restaurants and bistro’s are within walking distance of the b&b to accommodate you for lunch or dinner. Wireless internet service is provided for the convenience of our guests. 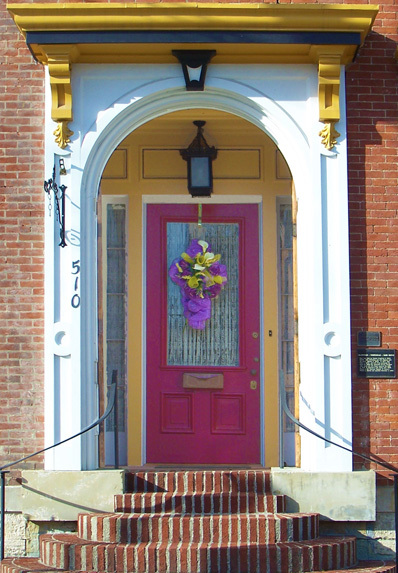 The historic Azalea Manor Bed and Breakfast is an ideal getaway for a romantic retreat, anniversary, celebration, business or vacation travel, visiting local family or students at Hanover College. The setting will provide you a refreshing opportunity to relax. Guests will find many ways to enjoy and renew themselves or a special relationship. The following list is to help guests discover ways to make the most of their stay. Whether you are coming from Indianapolis IN to Nashville TN, St. Louis KY to Cincinnati OH, or Evansville IN to Columbus OH, Fort Wayne IN to Louisville KY, or anywhere in between, Azalea Manor is a beautiful place to stop and rest.  Bring a good book or borrow one from our library and idle away your time lounging on the upper veranda.  Bring your walking shoes, take the river walk, Main Street Shopping, hike the gorges at Clifty Falls State Park, or even go bird watching.  Try antiquing and seek a treasure at one of our many antique, specialty or craft shops.  Sample your “just desserts” at one of our local coffee, confectioneries, ice cream shops or eateries.  Take a romantic horse drawn carriage ride through historic Madison to get a true feeling of what it was like to have lived in past centuries.  Bring your bike to tour the town, back roads & hills, or experience Clifty Falls State Park.  Bring your fishing gear, boat, skis, or jet skis to enjoy the Ohio River.  Try out one of the local golf courses to sharpen your game.  Enhance your knowledge of history by tracing the “underground railroad” & the trail the Morgan’s Raiders made through our county. 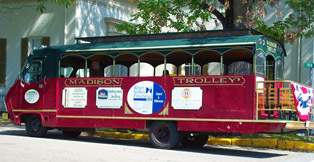  Take an old-fashioned trolley ride and learn about the historic sites and events of Madison.  Wine tasting at one of the many wineries in the area to taste and experience the bouquet of the region.  Try your luck at Argosy, Belterra, Caesars Indiana and Grand Victoria casinos.  Enjoy the free Music in the Park on the second Friday of each month from June through September. 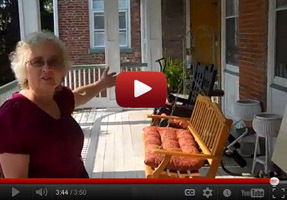  Tour historic homes, National landmarks and museums. We welcome your visit and look forward to providing you with outstanding service and an enjoyable stay. 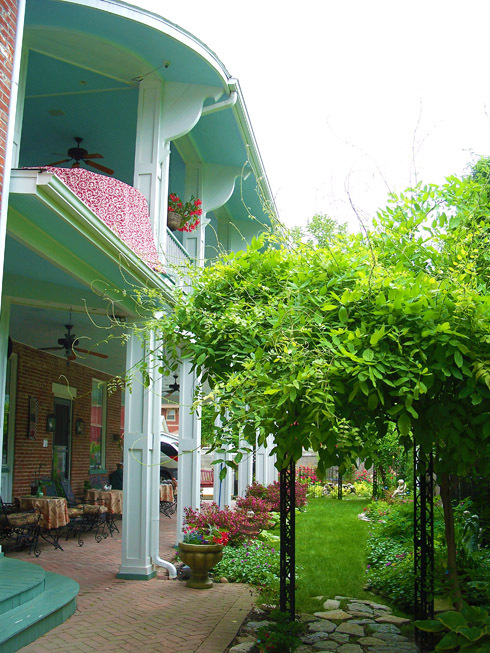 Experience Southern Indiana’s beauty and hospitality at Azalea Manor and the community of Madison. Checkout our events calendar below. Hopefully it will help you plan your trip.